Barbara Eileen Pedley was born in Brunswick, Victoria, Australia on 13 January, 1937 daughter of John and Frances Pedley. 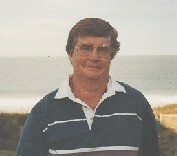 Beanie had a twin sister, Mary Therese (Billy), who died in June 2011. 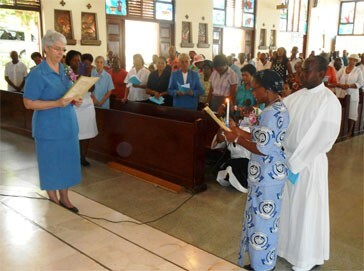 Beanie, as she was known, entered the Missionary Sisters of the Society of Mary on 3 May, 1963. 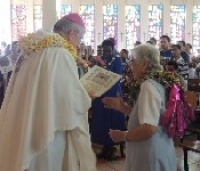 In the novitiate she took the name Sister Mary Mercy in honour of Our Lady, and the Sisters of Mercy from whom she received her education and training in general and midwifery nursing. After her first vows on 8 December, 1965, Beanie was missioned to Lourdes Hospital in Killara, which was at that time a Tuberculosis Hospital managed by the smsm. In February, 1971 Beanie was missioned to the British Solomon Islands and had orientation to mission at Buma, Tawka, Tetere and CentralHospital. During the following four years Beanie was a staff member at Tetere Leprosy Hospital and the Government Central Hospital in Honiara. She returned to Australiain 1975 for surgery and then preparation for her new mission in Bangladesh. 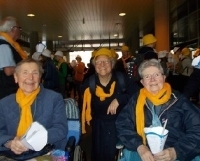 Together with Sister Shirley Morid, Beanie travelled to Dhaka on 5 November 1975 and joined our American sisters there. Tuital Health Clinic became home for the smsm in 1977. It was from Tuital that the sisters, helped over the years by international volunteers, and religious from other congregations, nurtured the people of Christian, Hindu and Muslim Faiths. Beanie’s missionary work in Bangladesh, a mission she cherished and loved was often hampered by her own ill health, requiring surgery in Australia at various times. In April, 1986, Beanie was accepted by the Sisters of the Holy Cross, Apostolate Abroad, for the summer programme for missionaries, in Tiberias, Israel. She often spoke about this most wonderful experience with thanksgiving and awe. She returned to Bangladesh after the course only to find that the government there would not renew her visa. This was a great disappointment for Beanie. Beanie was such a generous giver and it was her availability, adaptability and approachability that made this all possible. The sisters often expressed the fact that Beanie gave them a sense of security and peace. In January 2014, she was diagnosed with cancer and in March was admitted to Westmead General Hospital, Sydney where she spent the last four months of her life. Beanie carried on her ‘mission’ with the doctors and nurses in the hospital, encouraging and supporting them. Often the ’boot was on the other foot’ as she became the pastoral carer for the medical staff, sharing with them her expertise and experience. On 23rd July, Beanie was transferred to St Joseph’s Hospital, Palliative Care, Auburn. Her missionary journey ended quietly at 1pm on Sunday 27 July, 2014. Her brother-in-law John Skillecorn and three smsm were with her. 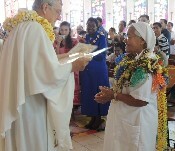 God is forever gracious and minutes before she died, Fr Isaac, a Papua New Guinean priest on duty as chaplain at the hospital, read her name on the door. Beanie had worked with Isaac on the streets of Sydney. “My friend, Beanie”, he said and gave her another Anointing. 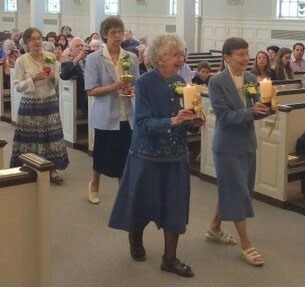 Her funeral mass was a joyful celebration of her life. Beanie died as she had lived – no fuss. Two facets stand out in her personality and spirituality – her common sense and sense of humour. 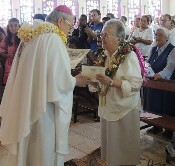 She could be gruff and perhaps tough at times but her wisdom, compassion and even tenderness stamped her Missionary, Religious and Marist life.